Polyamines (PAs) are ubiquitous polycations involved in many physiological processes in plants, including somatic embryogenesis, cellular growth and stress reactions. In the present study, we focus on the consequences in PA metabolism caused by polyethylene glycol (PEG) in proembryogenic Scots pine (Pinus sylvestris L.) liquid cultures. 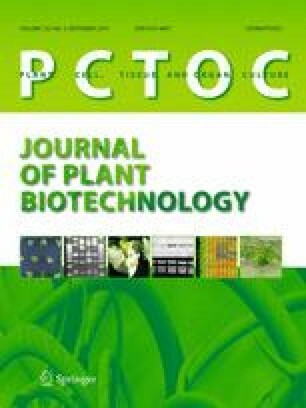 The growth and viability of the cell masses and changes in PA concentrations and phenolic secondary metabolites were investigated under control, 5 and 10 % PEG treatments. The effect of osmotic stress responses was investigated at the gene expression level including stress, cell division, programmed cell death and PA-related genes and PA metabolites. Moreover, the expression of ethylene and proline biosynthesis genes and phenylalanine ammonia lyase and stilbene synthase (psSTS) was analyzed. Under osmotic stress conditions, we found a consistent pattern of endogenous PAs in Scots pine proembryogenic cells. However, accumulation of free spermine (Spm) and methyl putrescine under osmotic stress might indicate their specific role in stress protection. Expression of polyamine oxidase was down-regulated under osmotic stress, suggesting the role of PA catabolism in regulation of Spm levels. Scots pine proliferating proembryogenic cells are in a developmentally undifferentiated stage where the content of secondary metabolites is generally low. However, in the present study the total content of phenolic compounds increased but the biosynthesis of phenylpropanoids and stilbenes, generally considered as stress-protective molecules, was not affected by osmotic stress. The online version of this article (doi: 10.1007/s11240-015-0805-4) contains supplementary material, which is available to authorized users. We are grateful to Ms. Eeva Pihlajaviita, Ms. Anneli Käenmäki and Ms. Hanna Leppälammi for their skillful technical help. We thank Meeri Pearson for proofreading the manuscript. This research was funded by the Thule Institute (2010–2013) (to HH), Academy of Finland (Project 121994 to TS) and Graduate School of Forest Sciences (to RMM).